Former French President Nicolas Sarkozy is to face trial for corruption and influence peddling, prosecutors say. The case centres on an alleged attempt by Mr Sarkozy to get a judge to reveal information about an investigation into illegal funding of his 2007 campaign. The judge and Mr Sarkozy's lawyer have also been ordered to stand trial. They have all denied wrongdoing. 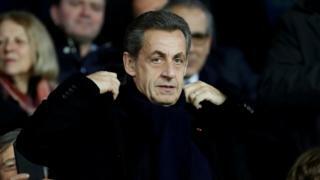 Mr Sarkozy's team says he will appeal against the decision. He faces other legal problems over campaign spending. In a separate case, the ex-president is accused of receiving funding from late Libyan leader Muammar Gaddafi. What is Sarkozy accused of? In 2014, two years after being voted out of office, the former French president reportedly contacted Mr Azibert, then a senior magistrate at France's highest court, the Court of Cassation. Mr Sarkozy, 63, is accused of phoning him and offering to use his contacts to secure a prestigious role in Monaco for Mr Azibert, in exchange for the information on a financing case. The call - in which Mr Sarkozy allegedly used the alias Paul Bismuth - was wiretapped by police. His challenge over the legality of the wiretaps was rejected. Mr Azibert is facing the same charges, as is one of the ex-president's lawyers, Thierry Herzog. The lawyer is accused of helping Mr Sarkozy contact Mr Azibert. In the funding scandal, Mr Sarkozy was accused of taking cash from L'Oreal heiress Liliane Bettencourt to help him win the 2007 election. He was eventually cleared. What other investigations does Sarkozy face? Last week Mr Sarkozy was placed under formal investigation over allegations that he received campaign funding from late Libyan leader Muammar Gaddafi in 2007. He denies the claims, saying his Libyan accusers want revenge for his decision to send French warplanes during the 2011 uprising. Mr Sarkozy also faces criminal proceedings over claims that he engaged in accounting fraud to exceed the limit for campaign expenditure in his failed bid for re-election in 2012. The case is known in France as the Bygmalion affair, after the name of the firm that allegedly provided false invoices to Mr Sarkozy's party rather than the campaign. Mr Sarkozy again denies any wrongdoing. Nicolas Sarkozy, a centre-right leader, trained as a lawyer but forged a career as a politician. He was mayor of the Paris suburb of Neuilly, and rose to be finance minister under President Jacques Chirac, before succeeding him as president in 2007. His term was overshadowed by the global economic crisis and resulting downturn. In 2008, he married Italian supermodel and singer Carla Bruni. The couple had a daughter, Giulia, a few months before the 2012 election. His re-election attempt was thwarted by socialist candidate François Hollande, making him the first French president since 1981 not to win a second term. His 15-hour stay in police custody in 2014 - over the allegations relating to the wiretapped calls - was also unprecedented for an ex-president in France. Mr Sarkozy sought the presidency again in 2016, but the Republicans instead nominated ex-Prime Minister François Fillon, who later lost to liberal Emmanuel Macron.